The billowing smoke could be seen for miles from Camp Pendleton on Wednesday, June 28. Photo: Courtesy of Frank Brennan. 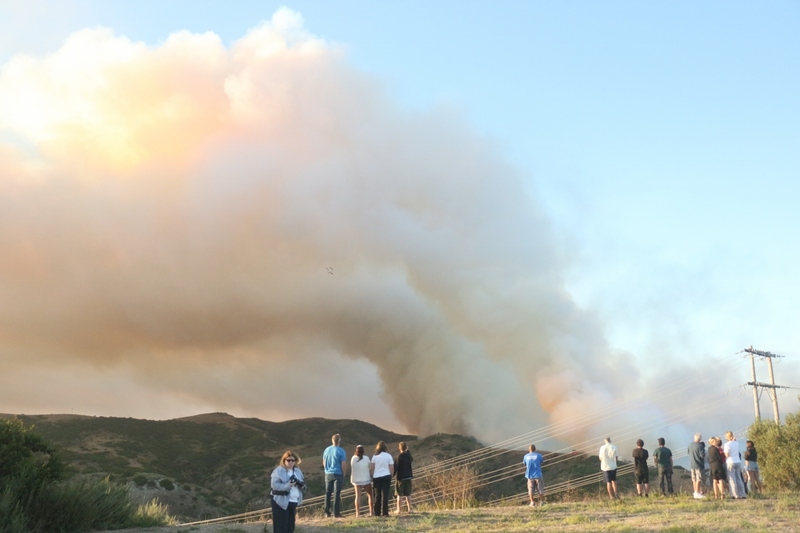 At a rapid pace, a wildland fire spread to 250-300 acres large, as of 8:20 p.m., in a matter of a few hours on Wednesday, June 28, adjacent to the southernmost parts of San Clemente. The fire is currently burning only on Camp Pendleton property and has not reached Orange County. Orange County Fire Authority spokesperson Larry Kurtz told the Dana Point Times that the fire had stopped moving west as rapidly as it had been earlier in the day. Kurtz said there have been no evacuations ordered at this time, and crews will monitor the fire throughout the night. “We’re looking a lot better than we were about an hour ago,” Kurtz said at 8:20 p.m.
At 10:14 p.m., OCFA officials said the fire had been stopped from moving in the direction of homes in San Clemente. Camp Pendleton firefighters, Cal Fire, the U.S. Forest Service and Orange County Fire Authority sent a fleet of suppression units, engines, areal support and the Forest Service will have a helicopter flying at night, according to posts on Twitter. About 350 firefighters were on scene at 8:20 p.m., Kurtz said, and the power lines that were in danger of catching on fire are being monitored by San Deigo Gas and Electric. Hundreds of people near the canyons on the south end of San Clemente came out to witness the inferno, as chunks of burned foliage rained from the sky. Smoke from the fire had blocked out a great deal of sunlight, while fire suppression planes dropped retardant on the flames. At about 5:30 p.m., people began posting photos and videos of the fire. Initially, Camp Pendleton officials said the fire was about 10 to 15 acres. That changed in the following two hours when the Marine base reported it had grown to 250. OCFA stated just before 8 p.m. that the fire had grown to 400 acres on Twitter, but that was later downgraded to 250 to 300 acres. As of 8:15 p.m., no home evacuations had been ordered for the San Clemente area, although flames could be seen less than a quarter mile from neighborhoods. Winds may have been a factor in the fire’s rapid growth. Forecasts from Windfinder.com showed gusts of 10 miles per hour, based on the website’s San Clemente State Beach monitor. Kurtz said the fire is not “intense” but is located in a grassy area where it can spread fast. The San Clemente Times will provide updates throughout the night. For immediate updates, follow us on Twitter at @SCTimesNews. This is a developing story. We will provide more information when it becomes available. Article last updated for change in size of the fire, as reported by OCFA.